"Without the JBI book club, I'd stop reading altogether. The club keeps me involved and thinking and makes me feel like I'm still a part of things." – Aaron C.
Today, hundreds of visually and physically impaired seniors are participating in JBI Talking Book Clubs. For each meeting, the members of the club select a title to be read and The JBI Library provides the participants with recordings of the book. Recent selections include The Reader by Bernhard Schlink, Shiksa Goddess by Wendy Wasserstein, and Show Me The Magic by Paul Mazursky. We even have Russian and Yiddish-language Book Clubs. Not only does this activity open up the world of Talking Books to those coping with age-related vision disease, but it counteracts the self-isolation and depression which often accompany those diagnoses. We recently organized our first intergenerational book discussion group for middle school students and seniors at an assisted living facility in Broward County, Florida. More such events are planned. 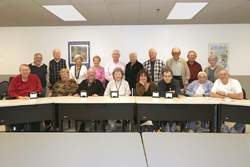 Sites of JBI Talking Book Clubs include JCCs, senior centers, synagogues, and numerous assisted and independent living facilities. For more information about participating in JBI Talking Book Clubs or forming a club in your area, please call Barry Pelofsky at 1-800-433-1531 x 119 or email bpelofsky@jbilibrary.org.